Make A Reservation at Your Favorite Location Online! 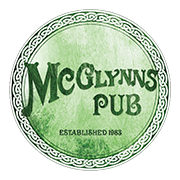 We would love to hear from you about your experience at McGlynns Pub. For BANQUET INFORMATION or GIFT CARDS, please call the Banquet Office at (302) 894-1200 or for the Dover location (302) 674-0144. Please enter your Name, Phone, and Email below when submitting a contact form.